Anquan Kenmile Boldin (/ˈænkwɑːn/; born October 3, 1980) is an American football wide receiver for the Detroit Lions of the National Football League (NFL). He played his college football at Florida State, and was drafted by the Arizona Cardinals in the second round of the 2003 NFL Draft. He has also played for the Baltimore Ravens and San Francisco 49ers. 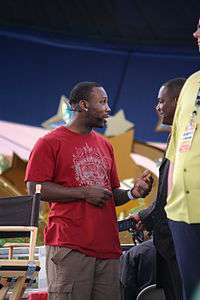 Boldin attended Florida State University. He was converted to wide receiver in order to get more playing time. In 23 games at wide receiver, he caught 118 passes for 1,790 yards (averaging 15.2 yards per reception) and 21 touchdowns. Boldin scored 7 TDs in his first year with the Ravens. He had 837 yards through the air as well, on 64 receptions. Boldin had six catches for 101 yards in the Championship game against the Patriots, but the Ravens eventually lost after a dropped touchdown pass by Lee Evans and a missed field goal by Billy Cundiff. 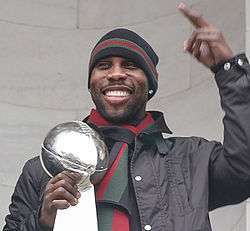 Boldin got his first championship title as the Ravens defeated the 49ers in Super Bowl XLVII. He had six receptions for a total of 104 yards, scored one touchdown and had a long reception of 30 yards. His Super Bowl performance was ranked 31st among all wide receiver performances and 13th in the AFC alone. He finished the postseason with 22 receptions, 380 yards and four touchdowns. On December 6, 2015, Boldin surpassed 13,000 receiving yards in a week 13 game against the Chicago Bears. Boldin caught 5 passes for 37 yards in the win. He caught his 75th career touchdown (and first with the Lions) on September 18 against the Tennessee Titans. He then caught the game winning touchdown with 19 seconds left against the redskins on October 23rd. Boldin's first son, Anquan, Jr., was born in 2004 & his second son Ashton Boldin was born in 2010. ↑ Hagemann, Andie. "Anquan Boldin named Walter Payton Man of the Year". NFL.com. Retrieved 7 February 2016. ↑ Anquan Boldin Profile – Florida State University Official Athletic Site. Seminoles.com. Retrieved on 2013-02-04. ↑ "SI.com – 2003 NFL – Draft Preview". CNN. 2003-02-24. Retrieved 2008-08-21. ↑ "Anquan Boldin Draft Profile". NFLDraftScout.com. Retrieved April 16, 2010. ↑ "Warner, Boldin power Cards past Smith, Niners". ↑ "Cardinals WR Boldin undergoes surgery to repair facial fracture". Associated Press. Archived from the original on 5 October 2008. Retrieved 2008-10-04. ↑ Gasper, Christopher L. (January 27, 2009). "Well-received". Boston Globe. Retrieved 2009-07-09. ↑ Somers, Kent (June 1, 2009). "Cardinals GM says Anquan Boldin now represented by Tom Condon". USA Today. ↑ Dufrene, Nick. "Boldin traded to Ravens". Associated Press. Archived from the original on 7 March 2010. Retrieved 2010-03-05. ↑ Writer, Staff. (2010-09-26) Anquan Boldin Makes History Archived July 21, 2011, at the Wayback Machine.. Football News Now. Retrieved on 2013-02-04. ↑ Boldin shrugs off AFC Offensive Player of the Week award-Baltimore Sun Retrieved 18 August 2012. 1 2 3 "Ravens beat Colts in wild-card round, win Ray Lewis' home finale". ESPN.com. 2013-01-06. Retrieved 2016-07-28. ↑ "Super Bowl 47 at NFL.com - Official Site of the National Football League". Retrieved 2016-07-28. ↑ Aaron Wilson (March 11, 2013). "Anquan Boldin traded to 49ers for sixth-round draft pick, sources say". The Baltimore Sun. ↑ Price, Taylor (2013-09-08). "Anquan Boldin Posts 208-Yard Debut". San Francisco 49ers. Retrieved 2016-07-28. ↑ Patra, Kevin. "Anquan Boldin, San Francisco 49ers agree on contract". NFL.com. Retrieved 3 March 2014. ↑ Fann, Joe (2015-12-06). "49ers WR Anquan Boldin Reaches 13,000 Career Receiving Yards". San Francisco 49ers. Retrieved 2016-07-28. ↑ History: NFL Football – Individual Player Records Continued. Sportspool.com. Retrieved on 2013-02-04. ↑ Njoku, Samuel (2012-12-11). "Ravens WR Anquan Boldin Provides Leadership To A Young Unit". CBS Baltimore. Retrieved 2016-07-28. 1 2 3 Price, Taylor (2014-03-03). "Is Anquan Boldin a Future Hall of Famer?". San Francisco 49ers. Retrieved 2016-07-28. 1 2 3 "Arizona Cardinals Franchise Encyclopedia". pro-football-reference.com. Retrieved 18 August 2012. 1 2 "Anquan Boldin Stats". ESPN Internet Ventures. Retrieved 27 March 2014. ↑ "First Person: Anquan Boldin, Cardinals Wide Receiver". SI.com. September 24, 2005. ↑ "Impact Player of Week 1: 49ers' Boldin". ↑ Anquan Boldin's weekend festival kicks off today. www.palmbeachpost.com. Retrieved on 2013-02-04. ↑ Anquan Boldin Foundation and Florida Crystals Corporation Summer Program Results Prove Significance – PAHOKEE, Fla., Aug. 28, 2012 /PRNewswire/. Prnewswire.com (2012-08-28). Retrieved on 2013-02-04. ↑ The Anquan Boldin Foundation. Q81.org. Retrieved on 2013-02-04.